WHEN I HAD THAT LONG BEARD, I SHAVED IT. OK? 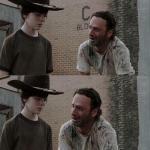 I DID IT BY MYSELF CARL! DAD... I DID IT. DAD! BY MYSELF! OH GOD.